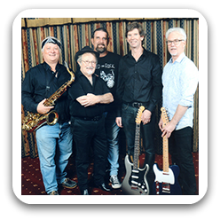 Brisbane Band 610 – If you want a band to play Classic Rock then Brisbane Band 610, one of Brisbane’s finest cover bands, is the right choice for your event. A versatile 5 piece lineup with 3 lead vocalists, saxophone, keys, guitars, bass and drums, Brisbane Band 610 performs authentic covers of a wide range of bands from the Eagles to the Angels and Beatles to AC/DC from the 60’s to now. They can tailor their performance to suit your event. Brisbane Band 610 plays with an energy that never fails to engage and excite the audience and gets people singing and dancing. Brisbane Band 610’s 3 main singers ensure variety in sound and style. Band members are all very experienced musicians with all professional gear and comprehensive stage lighting. For larger shows we can provide a sound professional to ensure a consistent and balanced sound. We have a full and varied set-list and can play a variety of musical styles including Rock, Blues, Country and Pop. Check out their song list below below. They tailor their show to suit client preferences and the venue. Clients can pick the songs from our song list or they can suggest a set list for an event. They can often play songs at a client’s request that are not listed on the song list. If arranged beforehand, guests may be able to join the performance.